Just completed extensive remodel completed October 2016. New cabinets, granite counter tops, new Stainless Appliances, new Maytag W/D, new flat screen TVs and much more! This 113 Acre Paradise is OCEANFRONT!!! This Beach Resort Condo is an awesome, over-sized, ground-level unit at Panama City Beach's best full-service/full-amenity resort, Edgewater Beach Resort. Enjoy the 12 pools, golf, oceanfront lagoon pool, chef oceanfront restaurant, Starbucks, tennis, fitness center, and a massage!!!! The condominium overlooks the first hole on the golf course and a beautiful lake, stocked with fish and turtles. The beach is a quick, 150-yard walk, or you can catch a ride on the resort tram. A private, heated, building pool is in back of the unit! The condominium is a split-bedroom plan, with mirrored walls in the master bedroom and the living room. You will find an immaculate unit that you will quickly call home. Every decorating detail is tropical. The master suite has a walk-in closet, double vanities, a separate bathing area, and a garden tub. The second bedroom has two Queen beds. Linens, towels, and dry goods are included. Three cable TVs, two covered patios, a beach restaurant and lagoon pool, and parking right outside the back door make vacation condominium living a luxury! Hello - I'm Terri Braswell, owner of 3 condos in Panama City Beach. 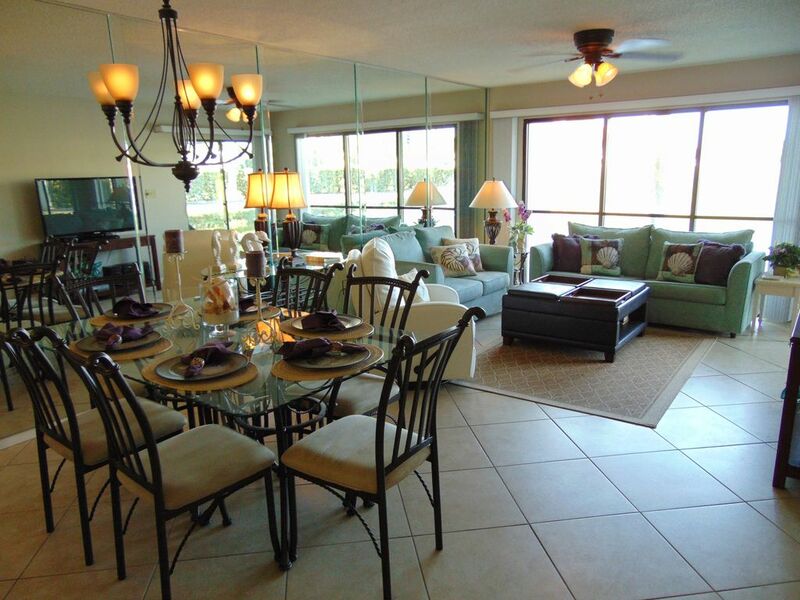 Edgewater is my family's favorite - ground floor, park right outside the door, convenient, beautiful views of the resort and golf course, by the tram stop, and very close to the beach. I have rented condos since 1995 - I am a very picky with my condos - they have to be clean and perfect, so when you walk in you say 'WOW'. It's your vacation, and I want it to be special for you. My renters come back again and again, and I hope you will, too! I am a licensed Realtor in Georgia and Florida, and I believe in Location, Location, Location. Edgewater is centrally located in Panama City Beach, with the most amenities of any resort in the entire Panama City Beach area. The condo is located perfectly in the Golf Villa area, with beautiful views of the lake, fountain, and the 1st hole on the Golf Course. The Beach Pool is the Best in Panama City Beach, with a fabulous restaurant by the pool on the ocean. A fun Par 3, 9 hole Golf Course, Starbucks, 12 Lighted Tennis Courts, 12 Pools, Full Health Spa, Starbucks, Gift Shops, Hair Salon and many other conveniences surround the resort. toilet, combination tub/shower, Newly remodeled, too! I am in the Beach View section of the Villa's, but you can't see the beach very well from my villa. You are LAKEFRONT, and on the GOLF COURSE. 1st hole on the golf course. On beautiful Lake, 150 Yards from Beach, with Heated Pool in Rear of Building... Lake is off Master and Living room. The resort is on the ocean. The condo is on the lake, but a very short walk to the ocean. Yes, my living room and master bedroom overlook the lake, fountain, and the 1st hole on the golf course. Some dry goods available. Please replace before checkout if you use them. Overlooks lake and 1st hole on golf course. Patio on Lake off living room and master, and Rear Patio off second bedroom. Heated Pool for the use of the Beach View Villas, outside our building in beside the parking lot. Tropical Decor, Beautiful Golfcourse and Lakefront off Master and Living Room, Glass Dining Table seats 6, Breakfast Bar and Stools seat 4, Queen Sofa Bed, King in Master with Double Vanity, Walkin Closet, Garden Tub, 2 Queen Beds in Guest with 2 Closets and Private Bath, Phones, New HVAC Unit, 3 Cable TVs, WiFi, Patio on Lake Pets NOT allowed. Everything was exactly as expected. We loved our week and Terri was wonderful to work with. The Condo is beautiful. The resort has everything for a relaxing week. Thank you very much! Please call me to rent anytime! Love to have you back!!! Super Clean and Great Proximity. We loved our stay at Terri's villa in the Edgewater Resort. The unit was very clean and just as described. Terri was very helpful when we contacted her regarding the ice maker and WiFi connection which both worked fine - it was my error! The unit sits directly behind the #1 green on golf course and a short stroll over the Edgewater's private bridge to the beach and dining facilities across the street. The heated pool for the villa is located 50 yards from the units front door.. We will definitely request to stay here again and recommend the unit to anyone. You were an awesome guest. Thank you for taking the time to write this nice review. You are welcomed back anytime! The condo was great! The property was clean, as was the beach area. The food at Oceans restaurant was great. They were having problems with the hot tubs breakers and was a little disappointed that the ones by the main pool weren’t working and when they did not enough power in the jets. Other then that everything was great. The owner of our condo was amazing to work with. Thank you very much Rich!!! You are welcomed to visit anytime! The condo was very nice and clean and you can walk to be beach across the bridge or the resort is moving folks constantly in the large golf carts. We loved the big pool too. I would for sure stay in this condo again. Everything was as pictured.. The kitchen was stocked better than any I have rented.. It was great to just drive up and go inside. Very nice villa and would recommend to everyone..
My family had a very nice time. It was everything it said it would be. Thank you Toni! I am glad you had a great stay. I will jump through hoops for my guests. Thank you so very much, and hope to see you again next year! Billiards, Bowling, Relaxing on the Beach, Relaxing at the Pool, Drinks and Food are served at the Lagoon Pool. Turtle watching from Condo Patio. Weekly rates quoted are Saturday to Saturday, August - May, and Sunday to Sunday in June and July. Nightly may be available in off season. All payments are nonrefundable. Holiday rates may be higher, to include Thanksgiving Week, and Christmas Week through New Year's Eve. Call me at 404-202-3501 for details. All major credit cards accepted with 3.5% convenience fee when renting direct.